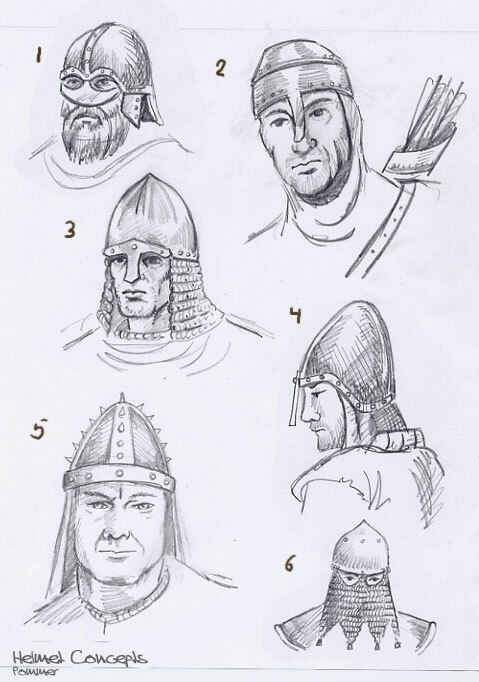 Here are some various helmet designs I've been sketching up lately. I know a couple aren't really in the Thief style, but even those can spark ideas sometimes. You should have given them a lable or a number. It's a bit hard to talk about them just by referencing the pic. The second row right one looks rather Thiefy to me. Also on the last row with the spikes. Yup, 2 3 and 4 would work. 2 is more or less what the private guards in t2 wore, 4 is pretty much what I put on my elite mercenary and 3 would work for the city watch elite. 2 might even work for the elite Builders. Edited by oDDity, 19 January 2005 - 10:56 AM. Ok, I've added some numbers to the pic, hope they match up to your comments! Edited by _Atti_, 19 January 2005 - 02:24 PM. Yeah. I was thinking the same. It would fit some special character class or such. Not very generic for our toolset, but for a campaing it could work. #6 is a poor sketch, but the concept is very cool. It's from a medieval sikh armour. I'll have to do up a better one later. I thought it would make an awesome headgear for some kind of exotic assassin character. Would fit for an Uber/Special/High End Guard...? 6 would be interesting for a specialized set of guards that someone could use in unique situations.